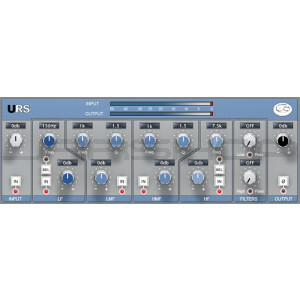 The URS S series is a six band equalizer with four bands of EQ and Low and High pass filters. Each band offers overlapping frequencies spanning 4 to 5 octaves. Our most advanced plug-in for the Pro Tools Platform. The URS S series is our ultimate Pro Tools mix equalizer tool with mastering accuracy and control features. The four bands overlap for track sweetening or specific problem solving. The low and high bands are switchable Shelf or Bell for that tight low end and smooth high end. Input and output metering and line level trims for complete gain staging. The Numeric display windows show you all current settings for Gain, Frequency and Q and Input and Output levels. Audio Units support for Logic Pro 7.x, Logic Audio 6.x, Digital Performer 4.x, Bias Peak 4.x, Abelton Live 4.x, Final Cut Pro and more! VST support for Mac and PC Cubase, Nuendo, Sonar, Abelton Live, Acid, Sound Forge, Bias Peak and more!